What was I just going to say? It was right there on the tip of my tongue! Our memory is a complex thing and when we try to do too many things at once, it interferes with the process. There are different types of memory. While we may understand short and long term memory, working memory is what makes us function day to day. Working memory is a form of short term memory. The difference is how we use it. Short term memory is literally remembering something for a few moments. Working memory occurs quickly taking the short term memory info and applying it to other knowledge using more complex brain functions like decision making and intelligence. More and more research is being done into understanding our working memory. It is a higher level of memory and comes into play in our daily lives over and over again. Tasks we may find simple, actually involve many steps and decision-making in our working memory. When this type of memory is impaired, not utilized and exercised enough problems obviously arise with daily functions. There are many ways to exercise our working memory. Most of the activities at MemoryMinders work this type of memory as it is crucial to our mind wellness. You too can exercise your working memory by stretching your brain with new or different mental fitness activities. Push yourself to try new things. Take up a new language or do something outside your comfort zone, if only for a few minutes. Engage in challenging brain games or relearn something you used to know, like an old card game or the musical instrument played when younger. 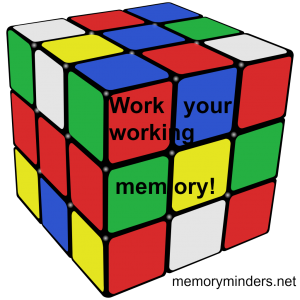 Work your working memory while focusing on one thing at a time and watch your memory improve!